With new Citibank software, banking information can be accessed from a customer's cell phone. The electronic wallet got one step closer to reality on Monday when Citibank unveiled a cell-phone-based service that lets customers pay bills, check their account balances and transfer funds, regardless of which wireless carrier they use. The free program, Citi Mobile, will be available for customers in Southern California via download this week at Citibank.com and will go nationwide this summer. AT&T, Sprint and Verizon customers can start using the program this week, with other carriers and a Spanish-language version out later this year. "We're changing. 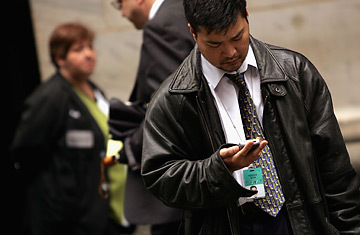 Banking is changing," said Citigroup CEO Chuck Prince at the launch event in New York City on Monday morning. "I look forward to the competition trying to keep up with us." Unlike last week's announcement by AT&T, in which Wachovia and other banks launched their own mobile-banking applications in partnership with the country's largest wireless provider, Citibank customers can access Citi Mobile from any carrier on over 100 handsets ranging from the BlackBerry to the RAZR. Bank of America launched a smaller mobile banking offering in Tennessee last month, and says it will take the service cross-country by year's end. A prime concern for potential users is security, which Citi Mobile protects in three ways. First, each time customers access their account by phone, they must enter a six-digit personal identification number (PIN). Second, no personal data, including account numbers, are ever stored on the phone. And finally, all information sent between the phone and the bank has 128-bit encryption. While a cell phone virus could still circumvent such security in theory, it has yet to happen even in countries where mobile banking is already widely used. Available for more than two years in Japan and much of Europe, cell-phone banking has been slow to catch on in the U.S., in part because of lack of interest. Wells Fargo shuttered its mobile banking offering in 2002 after only 2500 people had signed up over 18 months. (It plans to launch a new service later this year.) A recent study by Forrester Research found that only 10% of Americans said they would consider mobile banking, versus the 35% or so who already bank online. "It's hard to motivate someone to download something on their phone, and even if they do, it doesn't mean they will use it," says Forrester's Charles Golvin. While 20% of consumers have downloaded new ring tones, for example, less than 10% have done so with mobile games. Another hitch for mobile banking has been reluctance by wireless carriers and banks, both known for their strong-arm practices, to cede control over the application's look and feel. "Wireless carriers are not the easiest people to deal with. They want to control the user experience because in the end they are going to get blamed for it," says mobile analyst Roger Entner of IAG Research. Banks, on the other hand, are hyper-cautious. "They are so conservative and so security conscious. They don't want to do anything that will lead to fraud," says Gerry Purdy, chief mobile analyst at Frost & Sullivan. That may be why Citibank, the number four retail bank in the U.S., chose to launch its application without partnering with a carrier. The downside of this strategy is that the onus will be on the user to download the application, and even once they do, the Citi Mobile icon will be hard to find since it will be buried inside menus on each phone. When Wachovia launches its mobile-banking service later this year, on the other hand, its icon will get prominent placement on AT&T branded phones. Once mobile banking catches on, it's likely to pave the way for even more electronic-wallet services like making purchases at department stores, supermarkets and even vending machines. "This is just the first step of making Americans comfortable with using their cell phones as financial instruments," says analyst Entner. To take that next step, phone makers must embed a chip capable of near-field communication (NFC) that will work with special readers in stores, exactly like the contact-less credit and debit cards that are now available. Both Visa and MasterCard have trials under way, but have yet to announce plans for a national rollout.